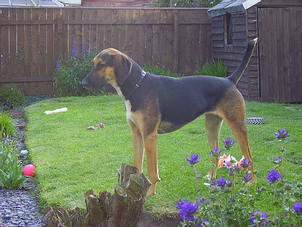 The only rescue to speicalise in Homing Foxhounds and scent hound types. -To provide a safe place for unwanted and abused Foxhounds and hound types, so they can get the care and attention they require. - To support and offer advice to new owners of the breed and educate the public on the breeds requirements and what the welfare does. - To continue to run as a Non-profit group of Volunteers. - To aid, where possible, with training issues owners may be having with their hounds. -To Re-educate the rescued Foxhounds, so they become accustomed to life as pets in a family home. - To Neuter, Microchip and give a booster to all animals in our care, before finding them an understanding forever home. -To Raise Funds and increase our volunteer numbers, so we can continue our cause in helping in the rehabilitation of unwanted and abused Foxhounds and hound types. - To find lasting support from Manufactures who also have an interest in dog rescue and rehabilitation. -To raise enough funds per year to become a Registered Charity (currently the requirements state that our charity must have funding of over £5000 pa). -To continue fighting public opinion about the Foxhound breed and raising awareness of what we do.